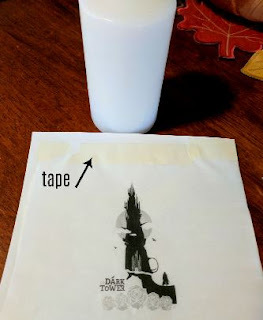 One Momma Saving Money: DIY Candle Image Transfer! Easy #Halloween Decorations! 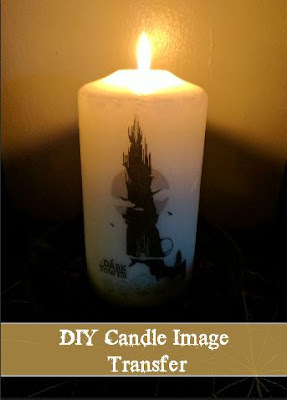 DIY Candle Image Transfer! Easy #Halloween Decorations! Last year at this time we watched the film The Dark Tower as one of our "Halloween" movies. Of course afterwards, I had to get crafty and see if I could do some sort of decoration for the film to add to our Halloween decor! The movie The Dark Tower is based on the best-selling book series by highly-acclaimed author Stephen King. 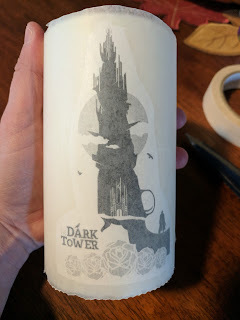 The last Gunslinger, Roland (Idris Elba), has been locked in an eternal battle with the Man in Black (Matthew McConaughey), determined to prevent him from toppling the Dark Tower, which holds the universe together. With the fate of the worlds at stake, good and evil will collide in the epic battle as only Roland can defend the Tower from the Man in Black. Find a design you want to use. I put mine into Word and then adjusted image size. 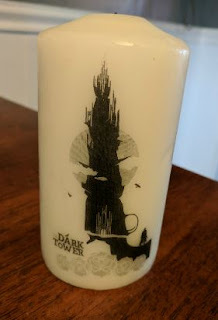 This was if you are using a five inch tall candle, you can make sure the design is under five inches. Cut a piece of tissue paper to slightly smaller than the size of your printer paper. Then tape the tissue paper (shiny side down) to the computer paper. Make sure it is smooth and flush. I only used tape on the top and bottom. 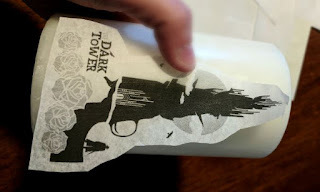 Print your image onto the tissue paper. Then cut down the tissue paper down giving a small border around image. 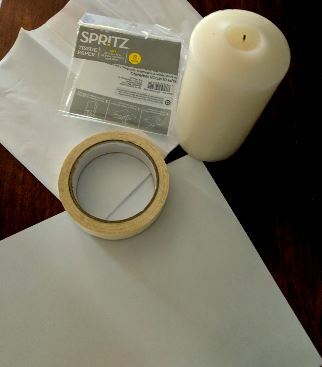 Lay your tissue paper image flat over the candle. Wrap tightly with wax paper. Heat the candle with your blow dryer. 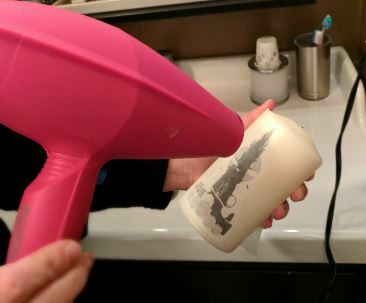 You are slightly melting the surface layer of wax so that the tissue paper adheres to the candle. You will see the tissue paper edges disappearing and the image until will brighten, this means the image is fused to the candle. Slowly remove the wax paper and admire your work! 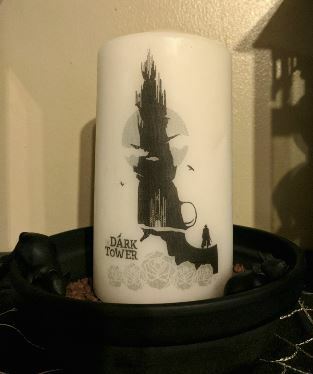 For the candle base, I took a terra cot pot base and sprayed it black. 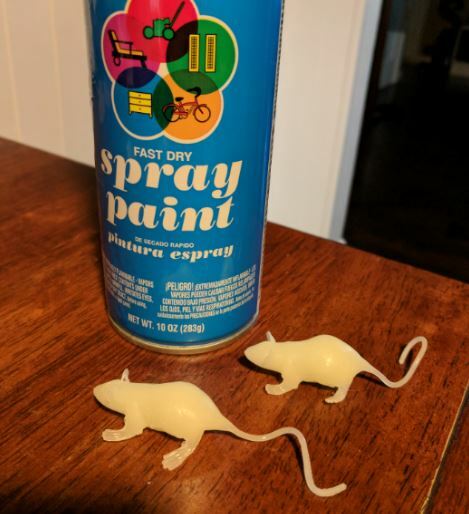 I then took glow in the dark rubber mice (Halloween section at Target) and sprayed them black as well. 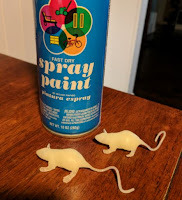 Glue the mice to the pot base. Add some decorative rocks and instant creepy design!